West Ham XI: Adrian, Tomkins, Reid, Ogbonna, Cresswell, Kouyate, Noble, Lanzini, Antonio, Carroll, Payet. Arsenal XI: Ospina, Bellerin, Gabriel, Koscielny, Monreal, Elneny, Coquelin, Iwobi, Ozil, Sanchez, Welbeck. I think we can all agree that was exhausting. But there's SO MUCH sport to keep you going. Keep across the rest of the Premier League action right here. And keep one eye on your work sweepstake hopeful with the Grand National live text here. Good luck muckers and cheerio. West Ham boss Slaven Bilic on his side's two disallowed goals: "You know I don't mind talking about that but this time I'll let the pundits talk about it for once because I always try to talk. But if you are saying it five times I look a bit ridiculous even to myself." West Ham boss Slaven Bilic: "Andy Carroll haseverything. It's impossible to stop him. "His work rate, watch how many times he tried to get the ball off them. He was keeping the ball, laying it off. Heading, he's maybe the best in the world. He has to stay away from those injuries. "He's professional but he's got to be totally dedicated to his career and football." Arsenal boss Arsene Wenger: "We've shown resilience and spirit to come back to 3-3. In the last 20 mins it could have gone both ways. I’m disappointed we didn't (have an answer to Andy Carroll). "I’m not here after the game to blame the players. We are disappointed to concede three goals. Particularly after 2-1. Overall it’s a shame. "Do we still have an opportunity to win the title? I don’t know. We made it more difficult today." "It was a great game of football. Magnificent," says West Ham boss Slaven Bilic. Should Andy Carroll have been sent off? Arsenal boss Arsene Wenger responds with a straight up "yes". Shane Daly: 3 goals doesn't get you to the Euros, sorry. Will the players in division three who score 4 goals this weekend be going? "It was a tough game. When we went down 2-0 it was disappointing. Best game in a West Ham shirt? “Three goals I think gives it away. “We’ve been practising crosses all week. They’ve conceded from crosses and it paid off." On the battle with Gabriel: “It was just one of those games. Both of us give it about, I don’t think either of us are dirty players. We’re still in (the top four chase). We’re happy with the draw." Are you thinking about going to the Euros with England? Here's the Premier League top six. 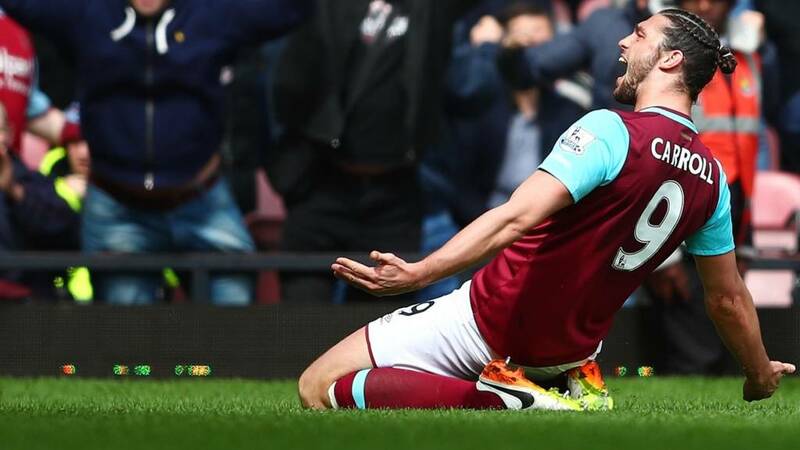 West Ham have work to do to get into the top four, but nowhere near as much as Arsenal need to do to win the title. Surely that ship has now sailed for the Gunners? Andy Carroll had 10 of West Ham's 16 shots in this match. No Premier League player has more than 10 in a match this season including blocked shots. Six goals. Another disallowed. A sending off debate. It's the Premier League season summed up in 93 minutes. "The turning point for me was when the goal was disallowed, Manuel Lanzini’s goal was onside. "Arsenal let two goals slip. If you lose a two-goal lead at this stage in the race, do you deserve to win the title?" If you haven't been pulled to the edge of your sofa by that one, then you're made of granite. A match of football that reminds you why on earth we put up with this ridiculous game most of the time. All it missed was a late, late sting in the tail. But I don't think the tickers could have handled that. Michail Antonio makes a similar decision to pull back Mesut Ozil. Booking. Arsenal break. Alexis Sanchez is on the run but is fouled by Winston Reid. Worth the hit for Reid there. Michail Antonio winds up one of his long throws for West Ham. Laurent Koscielny gets in a bit of a muddle but gets it away. And now Emmanuel Emenike and Mark Noble combine to find Dimitri Payet on the edge of the area, but it's a rare shot miles over the bar from the Frenchman. Three minutes of added time. Booo, we want more. "There is no midfield in this match. They just go from end to end. I don't want this game to end. If either side were to lose this, they would be devastated." Mesut Ozil puts a low ball into the Hammers area and Claret and Blue legs are flapping at it from all angles. They just about stop it from reaching Olivier Giroud. It's any means necessary at the moment. Dimitri Payet disco dances his way through the Arsenal midfield and goes down shoulder-to-shoulder with Aaron Ramsey. No free-kick, right decision.